After the anti encroachment and basement drive in the city on Friday the City corporation Belagavi team turned towards Shahpur and Tilakwadi. Here its focus was mainly on the encroachments like sheds, small eateries, stalls built illegally on the road etc. A Few of the make shift stalls and sheds put ahead of the shops were removed from the shops of SPM road and Khade Bazar. 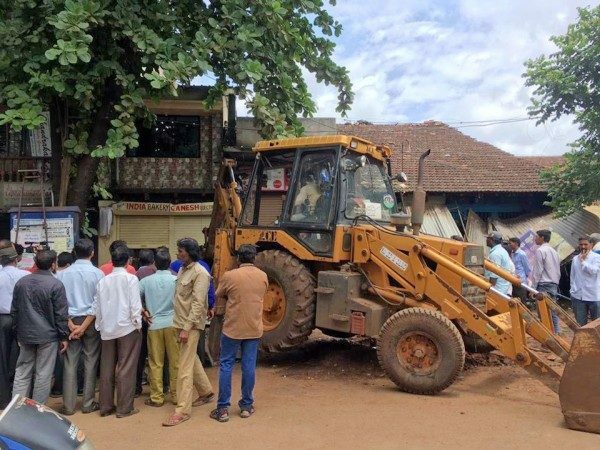 Also a few shops near the Corporation complex Basveshwar Circle were removed. In Tilakwadi a few basements were made free for parking and the owners were asked to use it for parking only. The eateries near Budhwar peth were totally removed and a couple of them on the Deshmukh road also were removed. Plastic Sheds ahead of the shops were also removed. The shop owners in Maruti galli closed their shops and went met the MLA. Maruti galli has the maximum number of Basements in the city. This current drive against basements has been the most successful in past seven years or so. The citizens are happy with this driver but at the same time will this solve the traffic problem in the city ? Only time can tell. Kindly do visit. New Gandhi nagar and Ujwal nagar too where main road using for parking. No one focus on this area. Shops stalled in main road itself. There are many such parking areas being used as flats being built by the developers in guruwar peth tilakwadi area. The corporation have to start identifying them n start clearing them also . The corporation should at least intimate the hawkers. Poor people also have rights. Follow due process. In rains it is the most inappropriate time to displace people. Advance notice will make the encroachers to take help of law. Recent times given to elected rep has (encroached) awakened the corporation commissioner. Corporation must be bold enough to clear the encroachment by politically connected people. Common men expect more bold steps from the corporation for making the city encroachment free.